Created on 2009-02-28 07:26 by Retro, last changed 2009-06-28 09:43 by loewis. This issue is now closed. I am reporting a bug which was not fixed in the closed issue #4389.
issue on my side or on Python's side? What version specifically did you notice this in? Python 3.0.1 binaries. Please fix these issues if you can. fixed. Since the 2.5 branch is now closed, no changes will be made to it. For 2.6.1 and 3.0.1, it works fine for me. See the attached screenshot. 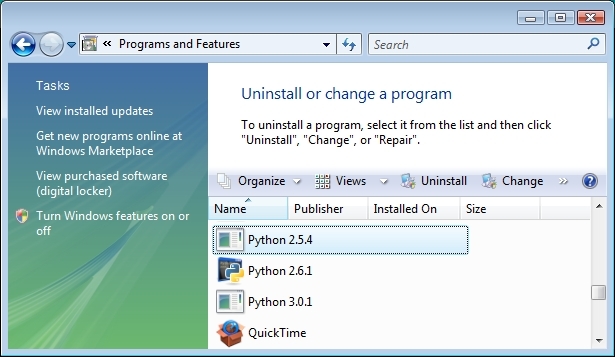 icons are shown in the Add/Remove Programs list for the Python interpreters. 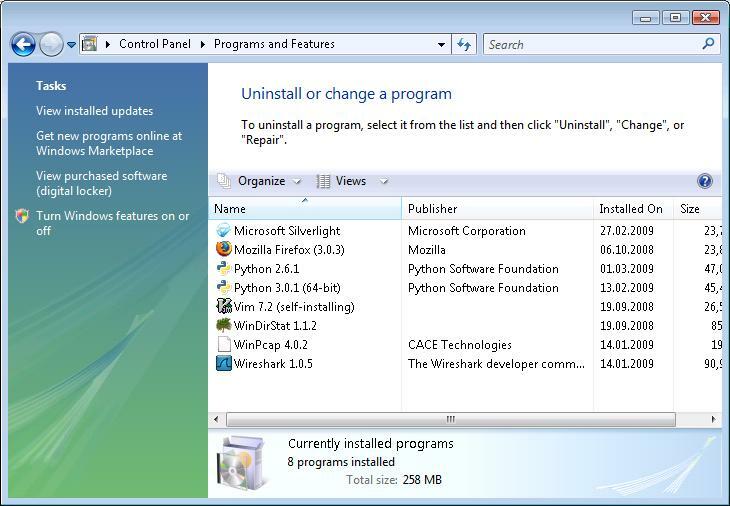 > Add/Remove Programs list under Widnows Vista. I don't have the property DisplayIcon for any of those two keys. keys and each of the keys contain only the property DisplayName as before. and compress and attach the resulting log file. Also, what version of Vista *precisely* are you using? mean by specific version. I hope I answered your question. I'm closing this as "works for me". The error is not reproducible. Extensions' be selected, I get an icon in the Add/Remove Programs list. 'Register Extensions' isn't selected at installation time. (or ever). Contributions are welcome. I think this is an easy fix. Please try to fix this issue. Thank you. understandable that Martin wants to fix more important problems. "REGISTRY.def" i.e the "Register extensions" feature. The following patch attaches it to the parent group. # Shortcuts, see "Shortcut Table"